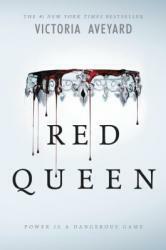 Red Queen by Victoria Aveyard reminds the reader that anyone can betray anyone. At the beginning of the book, Mare meets Farley, the leader of a group called the Scarlet Guard, a group that strives for equality between those with silver blood and those with red. Later, Mare, a red, gets a job at the royal palace because she talks to the prince, who decides to hire her. On her first day of the job, a freak accident causes her to get the power to create and control lightning. Because only silvers are supposed to have powers, the royal family decides to lie about her backstory and have her become the new princess. Mare and her new fiancé, Mavis, join the Scarlet Guard in order to give reds and silvers equal rights. In the end, Mavis reveals to Mare that he had been using her all along and attempts to kill her, but fails. Red Queen was a total disappointment. I have heard so many people saying that it is a great book, and I know it was nominated for the Blue Spruce awards, but I don’t see why. It’s like the author combined the plots of Hunger Games, The Selection, and Divergent. I love all those books, but I was hoping for something more unique. It was the most like Hunger Games, with the people in the districts like the reds, and the people in the Capital are like the Silvers. Also, most of the main characters were annoying, unlikable, and impossible to grow attached to. I thought it was fine at the beginning, but it lost my interest as it went on. I thought that the parts with the Scarlet Guard were very boring. The book in my opinion would have been much better without the Scarlet Guard. Also, the book does not provide any information of how their society came to be that way, something that should be included in any dystopian novel. I want to know how the Silvers came to be, and how they got their powers. I didn’t like how they wanted to fight against the silvers because of inequality between reds and silvers, holding all the silvers responsible for what only a few government officials did. Red Queen was hugely overrated, and I will not be finishing the series.